In the past few days, we had the pleasure of a (very) extended lunch with a good friend from high school days in Thessaloniki, Greece. Of course we talked about mutual friends from those years - how So-n-so hadn't changed, how (yes, you know who you are) actually did become a (prominent) doctor much to all of our and our teachers', surprise. And what about, you know who, I heard he died. No, not true, he's alive an well and playing the electric guitar. Of course there have been some deaths, and more than a few divorces, but many children who are now beginning to have children of their own. 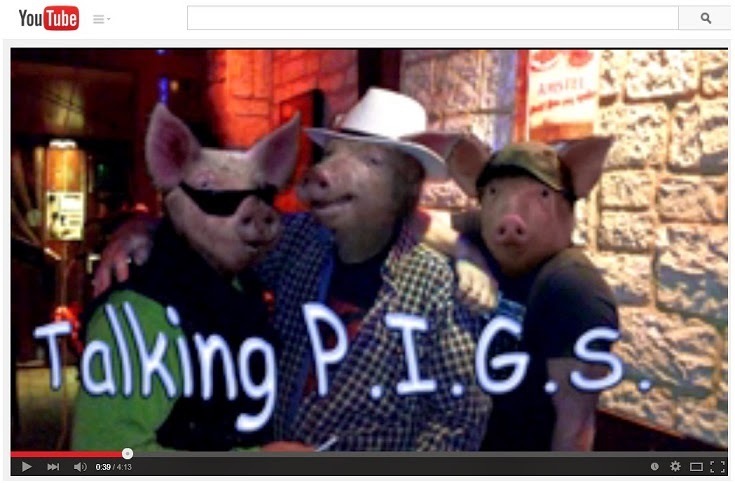 Some sing, including the snarlingly lovely Talking Pigs: We Won't Pay (As in Portugal, Italy, Greece and Spain). One thing in common for almost all of my Pinewood International Schools (TiHi to some) class of '78 is that we left. Many still live in Greece and in Thessaloniki or have returned, and they are closest to the pain. The real pain of the past decade, that has destroyed wealth and hope. Unemployment is running at levels not see in Europe since after the war, and at levels that encouraged the socialist - fascist civil wars of the 1930s. Those did not end well. But that does not explain why the Grexit is inevitable, and why it will happen very soon. This is what the Greek people voted for. No, they did not vote to stay in the Euro, they voted for the party that said it would reduce the debt and meet pension obligations. The Greek people and voters are not stupid. They knew this could only happen by either the rest of Europe bailing out Greece again, or by leaving the Euro. The Greek people know perfectly well that Europe is not going to bail them out, because to do so will only set everyone up for the next bailout. The Greek people, and the rest of Europe, know full well that the debt will never be repaid, and that the Troika are now acting as nothing better than the enforcers of loan sharks. Syriza knows that it had six months before the voters would throw them out, and once out, Syriza would never come back. The Greeks needed to show "good faith" in actually attempting to negotiate a resolution with the Troika. This has now been done, and is failing. The demand for reparations from Germany is designed not to actually extract the reparations, but to anger the Germans to the point that they will block any compromise that Syriza would have been required to accept. The Greek government, elected by a battered and exploited Greek people, has been establishing the conditions that will give them the moral high ground (in the eyes of their voters) needed to actually leave the Euro. Having set the conditions, when will it happen? "Predicting the future is easy, getting the dates right is almost impossible." I would attribute that quote, but so many people have said that any attribution would be inadequate. But it certainly is true, and while I love to predict, getting the dates wrong is a specialty. That being said, I'm still guessing May 9th. Greece will leave the Euro, and they will do it sooner than later. They've made the April payment, but simply do not have the money for the May or June payments, and they cannot pass the legislation required by Europe and the Germans and stay in power. That gives us a late May or June date. So why earlier? Imposing currency controls will be a fundamental element of any Grexit. Accounts will be frozen, and any money in accounts will be re-denominated in New Drachmas. Once the bank accounts are unfrozen, the residual, former Euros will now be worth whatever the New Drachma has dropped to, and the drop will be significant, over--correcting to the downside. Once it is accepted that the Grexit is coming and there will be no last minute deal, and with memories of Cyprus too fresh in every Greek's mind, the money will flow out of the country. Not just corporate money (most of which is probably off-share already) but any remaining personal money in bank accounts. So Greece has to move before the coming Grexit is perceived as inevitable, and the money starts to flow out. When the Grexit happens, it will be on a weekend. The banks will be closed, parliament will be called into emergency session, and a packet of laws will be passed. As this needs to be on a Saturday to avoid wholesale capital flight the moment that parliament is called into session, were it a weekday. This leaves only a few possible dates. And where there are few possible dates, I'm punting on the earlier date, so earlier in May. And looking at the calendar, that leaves us with May 2nd, 9th or 16th. My own guess is that the 2nd is too soon, and the 16th is too late. That leaves me guessing May 9th. I wrote a long comment and then the blogspot ate it. Lenders want their money back and do not want to lend more unless they are confident it will get repaid. So they add conditions. So the new Greek plan is to run away. OK, run away. Lenders will still want their money back and will be unlikely to lend more regardless of the name of the currency. But (and here's the cunningly brilliant plan), Greece can follow the US approach and just print money to cover the deficit :) And, by changing back to drachma it can revalue (for about 3 seconds) so 1 drachma = 310 billion euros. Debt repaid, deficit solved, bring on May 9th. Of course this won't work. The US gets away with printing money to fund deficit spending because it has a large economy and a globally valued currency. Greece doesn't have either. So, on Grexit the new drachma will tank, the euro-denominated debt will surge in drachma, and no one will be lending new money. So there can be no deficit so no problems are solved, just exacerbated. Greece needs to change its spending patterns. No one else can do that. It needs to spend less than it earns and use the difference to reduce the debt mountain. It can be done (ask Brazil). I like the 310 Billion Euro Drachma. Even the US talked a few years ago of minting a single $1 Trillion coin. Didn't go anywhere, but hey, if Zimbabwe can play, why can't the rest?